With the teasers of the upcoming Toy Story 4 bringing back the memories and excitement of the blockbuster movie series, it is about time that the older fans get their children or younger brothers and sisters on the hype train and the current fans expand their collections. With the new Toy Story 4 movie around the corner, your children may be getting more and more excited about playing with Toy Story toys. If they’re looking for new ones, you may have found that there are a ton of options available online. Well, we’ve researched the best choices and reviewed them for you below. In addition to this, you can find a buyers guide section which provides you with more information on how to go about picking the best Toy Story toys for your child. The Sheriff Woody toy has a fantastic design which looks just like the character from the movies. We liked how it talks back with up to 20 of Woody’s classic lines which kids will recognize from the movies. A must have collectible for any kid that likes (or loves!). This figure can also be made to pose in various ways which provides kids with freedom to play with it how they like. What age is this recommended for? What makes this option stand out? This is a fan favorite toy that feels straight out of the movies and fits perfectly well in a collection with several other toys on this list like Buzz Lightyear, Jesse, Zurg and Bullseye. Another fan-favorite toy from Disney’s Toy Story movie series – Buzz Lightyear! Our beloved space ranger toy is now within our grasp as it amazes everyone with Tim Allen’s voice. We were impressed with how it can talk to kids and say the famous phrases, such as “No back talk!” and “I have a laser, and I will use it”. To add more to its awesomeness, its wings can be folded and they pop out followed by the twinkling of lights. This can be achieved by simply pressing a button. Not to mention, it also has a karate chop action and a retracting helmet! We liked how this toy encourages kids to play with more creativity. It’s also highly interactive as a result of the talking feature. 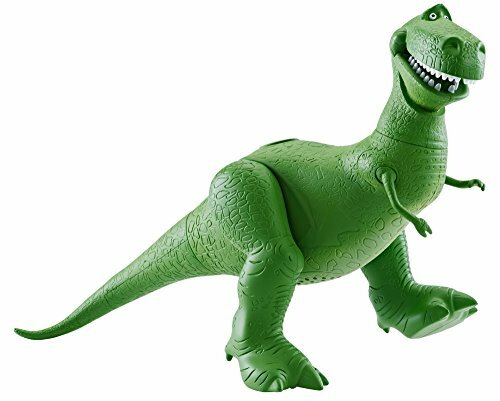 A great addition to every kid’s Toy Story collection, this Toy Story fanatics green dinosaur speaks 20 of its classic lines from the movies. Kids get incredibly excited with this feature and it’s highly interactive. We liked how children can move the arms, legs, and head of this Rex toy to pose it in any position they like. This ensures that they’re able to play with it in more imaginative ways. The design of the toy is also awesome as it looks just like the beloved character from the movie. Kids have been having a blast posing and playing with this toy creatively. They also love how it speaks to them with lines that they know from the movies. Should Woody be separated from his best friend from Toy Story? Absolutely not! When we add Sheriff Woody as a collectible, Slinky Dog automatically becomes a must buy, being his best friend. Just like man’s best friend, Woody’s best friend also sits up and wags its tail. Slinky can be pulled up to 21 inches and makes a fun sound when released. With a high global rank among action figures on Amazon, Slinky easily makes it on our list as the adorable must-have companion for anybody. It’s an excellent toy that enables children to play with it in more imaginative ways. Due to the realistic movie design, they also love to reenact scenes from the movies. The slinky spring makes it a fun toy for kids and adds a unique element to the way that they can play with it. The soft materials that they’ve used to make this Slinky toy gives kids the chance to cuddle it. Parents find that this toy makes for the perfect sleeping companion to help their little one get to sleep. Due to it’s smaller size, this toy is also a fantastic toy for children to take with them while you’re on longer journeys. They can cuddle and play with it to keep them entertained. We also liked how they are encouraged to play with the toy in more creative ways. This is a result of the more simple design. Kids have to use more of their imagination when playing with it. 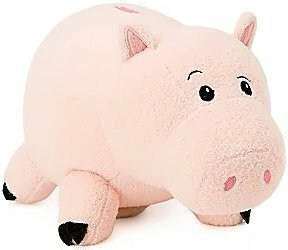 Since this toy has been made with soft plush materials, kids love to carry it around with them while traveling and cuddle it when going to sleep. Whether it’s a Toy Story or not, no story is complete without a villain and neither is a kid’s toy collection set. If we have a space ranger shining lasers and expanding his wings on the shelf, there absolutely must be an evil emperor with a glowing pair of eyes, who wants to destroy planets, to give the former some challenge! Collect Emperor Zurg as a deluxe Toy Story gift for your child and they can use it to play alongside their good guy characters. This provides them with the chance to be more creative and come up with their own lines. We also liked how this toy is able to speak 14 lines from the movies. Not to mention, all of the body parts can be easily moved around which ensures kids have the freedom to play with it creatively. This is a fantastic toy which comes with a talking function and enables kids to play with it in very creative ways. 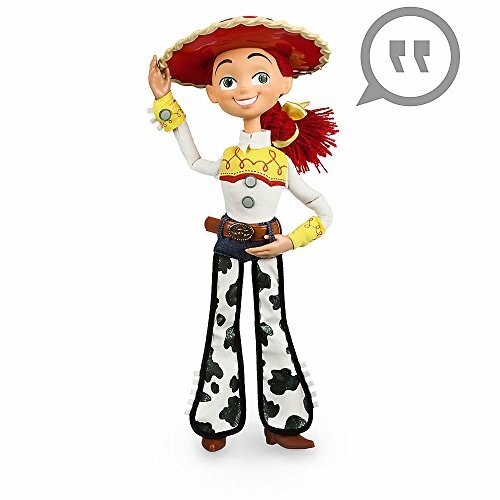 Here comes another fan-favorite toy from Disney Toy Story – Jessica “Jessie” the Yodeling Cowgirl! We liked how the body has been made with soft materials as it’s easy for kids to play with. The design of the figure is very close to how the character looks in the movie and we were impressed with how you can remove the hat and put it back on when you please. This provides children with more items to play with which improves their creativity. A string can be pulled to hear this Jessie toy say 30 different lines from the movies. It’s a highly interactive feature which kids have been loving. This pull-string toy is a lot of fun for kids to listen to and play with. The removable hat feature is unique and provides kids with a new element to play creatively with. 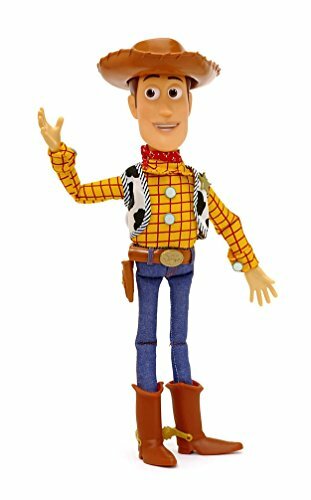 This is a pull string version of Sheriff Woody that is 16 inches in height, making itself a fun toy to play with. It has a soft body but a solid head and boots and guess what it says under those boots? You guessed it – Andy! We found this to be a great little detail which fans of the movies have been appreciating. Furthermore, we were impressed with how the toy can speak with 19 different lines which kids will know from the movies. It’s highly interactive and can be easily activated by pulling the string. The softer materials used to make this toy make it easy for younger children to play with. We also liked how it comes with a talking function as it’s highly stimulating and exciting. A major toy introduced in Toy Story 2, Bullseye is yet another fan-favorite Toy Story toy on our list. This 16 inch large toy with plush covering provides kids with a cuddly toy which they love taking with them to bed. 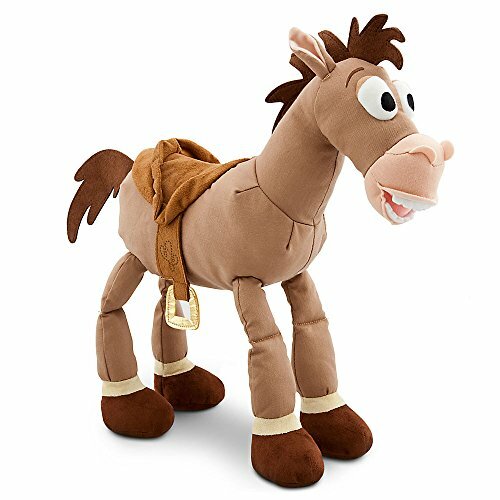 This soft and adorable Bullseye flaunts detailed plush sculpturing on its body and a faux suede saddle on its back, making it a great collectible as well as a soft toy. Additionally, each of its hoofs has an embroidered letter on it spelling A-N-D-Y! It makes for a great addition to a Toy Story collection and a soft-to-touch companion for the little hands of any kid, Bullseye is a sure shot win on our list! With such soft materials, your little one will love holding onto this Toy Story toy as they go to sleep at night. The attention to detail is also fantastic and makes it an excellent toy to add to your child’s collection. What’s better than one toy? How about 2 of them in a set! This Toy Story Woody and Buzz Lightyear set provides kids with 2 dolls to play with and be super creative. We liked how they’ve used plush materials for this set as it means kids can take the toy to bed to help them sleep better. The bean bag material on the inside is what has been catching most people’s eyes. It provides the toys with a unique feel which kids love to hold onto. These toys can also be stood up on their own, which is pretty impressive. With a unique bean bag and soft material used to make these toys, you’ll find that little kids less than 1 year old love to snuggle up to them at night. He might be the most evil resident of Sunny side daycare but one just can’t loath him. The antagonist plush toy is about 15 inches tall and has been embroidered with detailing. This attention to detail gives it a realistic look which kids have been loving. This wicked but cute dictator of Sunny side daycare comes with a good side as well – a strawberry-smelling tummy! The textured fabric and vintage look only adds to the love that we can give this one. We can understand why it has a rating of 4.6/5 starts on Amazon. So, want teach this evil dictator from Disney Toy Story 3 a lesson? Put him on your bucket list! This is a soft plush toy which kids love to cuddle with. The strawberry-smelling stomach is a very unique feature which children have been having a blast with. 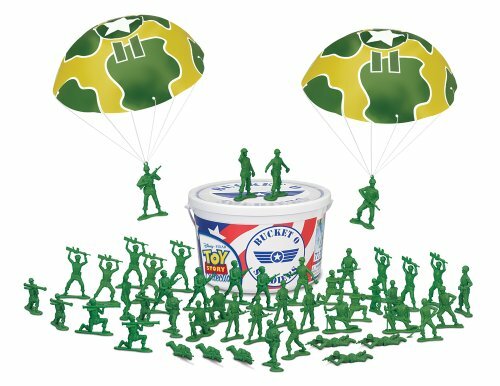 This Toy Story themed bucket has 72 green plastic soldiers which are scaled movie-accurately to the 12” Buzz Lightyear toy in order to be added to a collection. The soldiers are present in different poses in the bucket and bring a varied arrangement to the decoration for a showcase or shelf. What’s even more impressive is the feature that these soldiers carry in their parachutes – there are working plastic parachutes representing their film accuracy with not only their sizes but their functions as well! Don’t be deceived by their sizes – the soldiers are small in size but are sturdy like real soldiers and can easily survive the “step-on” tests done by the little feet. With such a sturdy and realistic movie design, you can be sure that your kids will have a lot of fun playing with this set for years to come. This red and white chattered phone has geared up once again to help Woody. This retro styled classic roll-along pull toy comes with a ringing rotary dial. This oldest member of Sunny side daycare is really hard to break in real life too. It has four bright blue wheels and has a string attached to it which has a plastic wrap at the end. The string has been made to look like a wire for the telephone. 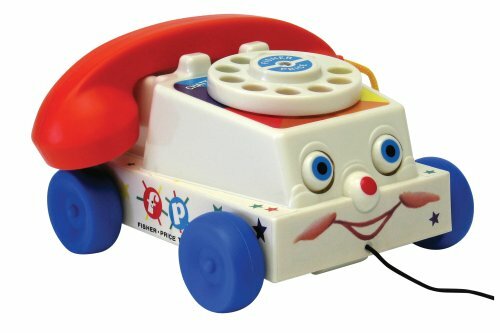 This plastic telephone, with eyes that roll up and down as it is pulled along, inspires children to play with it in more creative ways. This wise and friendly telephone might look helpless, but remember, he is the only one who can help Woody and his friends to escape from the daycare! We were impressed with how durable this toy is and how kids can use the pull-along feature to play with it in more imaginative ways. This mini version of the Toy Story toys is super cute and comes in great packaging! 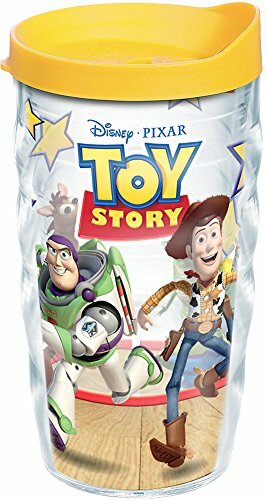 Sheriff Woody, Buzz Lightyear, Jessie, Bullseye, Rex, Zurg and several others come together to form this super package of mini Toy Story toys! Jessie and Woody have detachable hats that enhances the fun of playing with them. These mini heroes are made of a hard but flexible plastic, making them dynamic but sturdy at the same time. They have moving parts and can also be used as cake toppings! Since there are so many Toy Story mini figures included, kids get super excited about how they can use them all to play in incredibly creative ways. With such a wide range of toys available in one set, your kids will be able to have a blast playing with them for endless hours! Andy’s best safe keeper Hamm, the overweight piggy bank, is now available in a miniature form. This smart, pink, practical guy may not be able to keep your coins safe but most definitely deserves a place in your kid’s toy trunk. The plush toy is small and handy and has the potential to brighten up your living area or car. This cute little handful of joy is a delight for children. The vibrant and realistic movie design encourages children to play with it in more creative ways. Since this toy has been made with softer materials and is 7″ in size, we recommend it for younger children who are around 2 years old. It’s fun for them to play and cuddle with. 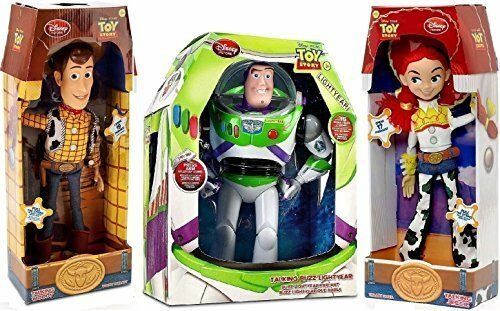 Three classic Toy Story heroes come together in this 3-in-1 package. It includes Sheriff Woody, Buzz Lightyear and Jessie Cowgirl all together! All of them have a talking which enables kids to listen to their iconic movie phrases, making them come alive for your kid. Woody is 16 inches tall, Jessie is 15 inches tall and Buzz Lightyear is 12 inches tall. These are great sizes that are also easy for kids to handle. We liked how there are 3 toys in 1 as it gives kids the chance to start playing with them more creatively. Woody and Jessi have pull string features whereas Buzz Lightyear flaunts an advanced button which you push to make him talk. You can also open the star command panel on his arm too. With the 3-in-1 package, you can be sure that your little ones will have a lot of fun playing with this figures for hours on end. 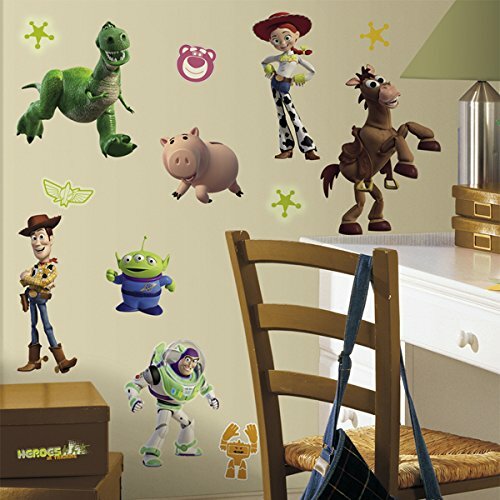 Several Toy Story characters come together in this 34 wall decal sticker set to awe anyone who enters your child’s room. All of them have glow in dark elements which makes them stand out even more in the absence of light! This is also visually stimulating for kids. Jessie, Woody, Buzz Lightyear, Rex, Bullseye and many more are all present together in this beautiful multicolored sticker set. Children who are fans of the movie love being able to look around and see their favorite characters around them. These stickers can be applied to any smooth surface without the fear of them peeling off. The biggest plus is that they can be removed and re-positioned without any sticky residues! Best stickers ever? You decide! We liked how there are so many stickers available in one set and how you can easily remove and reapply them somewhere else. 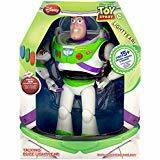 With six iconic Toy Story toys including both Woody and Buzz Lightyear, together in a single set, your kids will be able to play with them for endless hours. We liked how this set provides them with a range of toys as it means they can start playing creatively and coming up with pretend play scenarios. This is excellent for their creative thinking. They are made out of hard plastic and thus are very sturdy. Therefore, you can feel confident that they’ll last your child for years of play. They don’t have dynamic parts or actions like some of the bigger toys on this list but that doesn’t take away their beauty and only adds to their sturdiness! The set contains six iconic characters together in a sturdy build and provides them for multiple functionalities. A smaller version of the original Slinky Dog from the Toy Story movies – this one is smaller but even more adorable! Just like his bigger version, this one will also follow your kid around when his leash is tugged on. Of course, his slinky feature has been retained in this version as well and he can be stretched up to 8.75 inches! 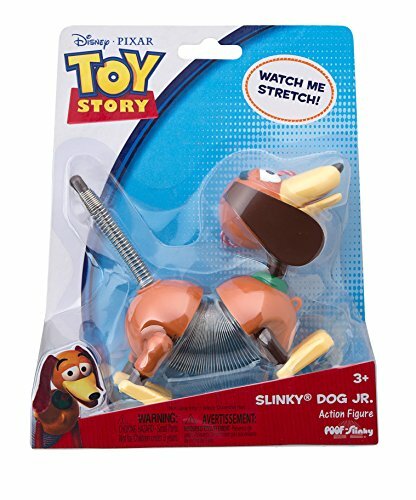 The Jr. Slinky Dog does not roll off his feet easily and is very sturdy. Although he is small in size, he has a big rating of 4.1/5 stars on Amazon! 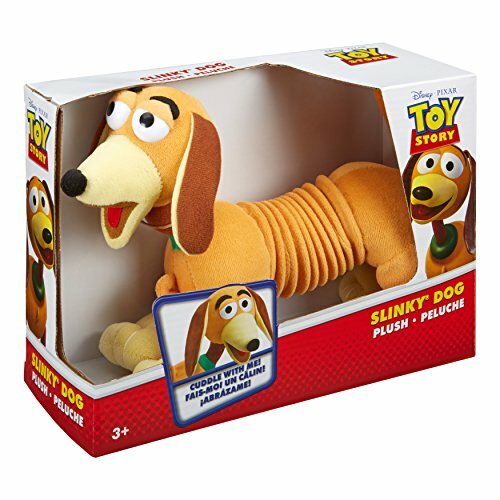 This is a smaller but more adorable version of the original Slinky Dog from Toy Story and can serve as both a collectible and a Slinky Toy. This is a Sheriff Woody themed pillow for the young ones! 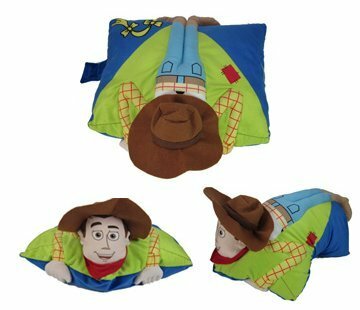 This Toy Story pillow is made of 100% polyester and it folds using a Velcro strap. It can be your kid’s nighttime buddy as it can be folded and carried around everywhere and slept on whenever needed. So, if you’re on a long journey, this pillow could come in very handy to keep your child comfortable and entertained due to the Woody design. This pillow has an entertaining Woody design which kids have been loving. It’s also incredibly soft and enables children to sleep on it comfortably. Another creative entry on our list – this item can serve both as a tumbler and a toy for your kid! This one is very sturdy and can be easily microwaved and washed in the machine without worrying about any damage being caused. It is great for storing both hot and cold items and produces minimal condensation. The printed wrap-around design on this tumbler is sealed between its walls and doesn’t get peeled off easily. Your child will love to use this item as both Woody and Buzz Lightyear are featured on it and they won’t be fading out any time soon. This gift can serve both as a plaything for your kid and a tumbler full of joy as Woody, Buzz and friends accompany them. The creative entries go on as Hamm the piggy bank from the Toy Story movies becomes a reality! We were impressed with how they’ve designed the toy to look just like the character from the movie. Although Hamm is a supporting character, it doesn’t detract from the fact that he is super adorable and very useful as well! This one is a bit less of a sturdy toy as he is made of pottery material (ceramic) and thus must be handled with a bit of care. 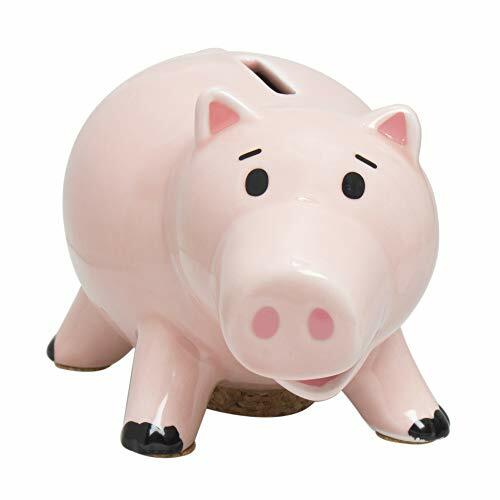 Kids who love Toy Story will love being able to use the Hamm character as their piggy bank to save up money. It encourages children to build up the good habit of saving from a young age. If your child is a fan of Toy Story, and you’re looking for a way to help them learn how to save money, this could be the perfect present. This Toy Story figure collection is exactly as its name suggests – a big bucket filled with adorable little green alien men! Just like the super hit Bucket O Soldiers, this one is another bucket full of awesomeness in the form of Little Green alien men who are not trapped in the Pizza Planet anymore but inside this bucket. Does your kid want these men under his command? Put this bucket on your bucket list and make your kid the commander he wants to be! These hard and sturdy aliens have garnered great reviews from parents, showing their incredibility. They are a great addition to anyone’s toy story collection and give several kids the chance to immerse in interactive play-time using multiple toys. The little green alien men are a great addition to any Toy Story set, making the collection more lively and the bucket can serve as a perfect container to store the toys together. 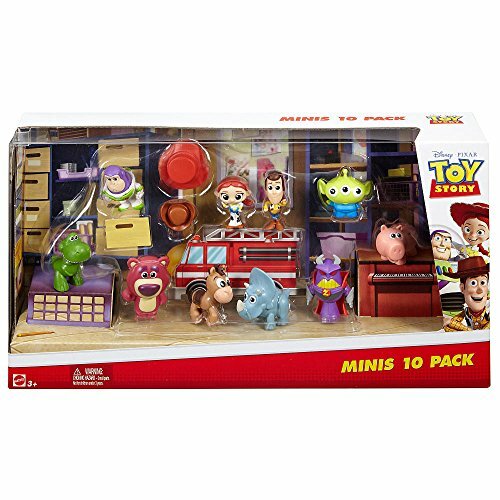 This Toy Story figure play set offers 9 small Toy Story figures along with Toy Story stickers – a marvelous deal! 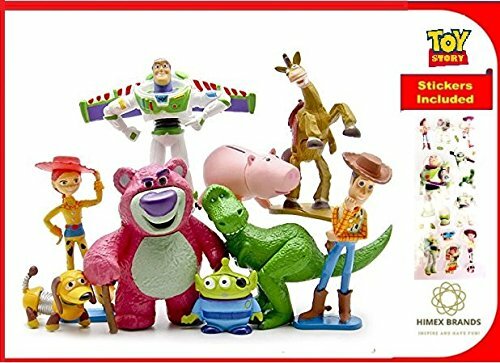 With a total of 9 major characters from Toy Story available, your kids will have a ton of fun playing with them for hours. They’re given the chance to be super creative with them too. They can be used as toys, collectibles or even cake decorations! A multiple-character set is always a win-win situation as they serve as entertainment items for multiple kids together. If your child uses the set with their friends, it can be a fun way to develop their social skills. Multiple main characters together mean kids have plenty of opportunity to have fun and get creative. 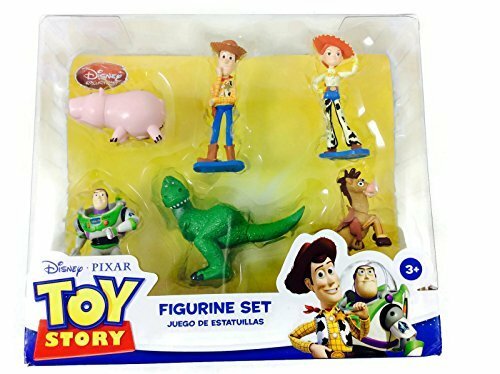 This Toy Story figure play set is a perfect gift for a young Toy Story fan. Coupled with the beautiful packaging, the well built toys would attract any kid towards them. It’s another multiple-character set on this list which ensures that kids are provided with plenty of options to play with them in more imaginative ways. We liked how this also encourages kids to want to play with the set in groups with friends. It can be great for their social skills. All of the figures available can be posed and left on display after your children are finished playing with them for the day. Multiple main characters from the Toy Story movies come together in different and lively poses with sturdy builds to last your child for years of play. 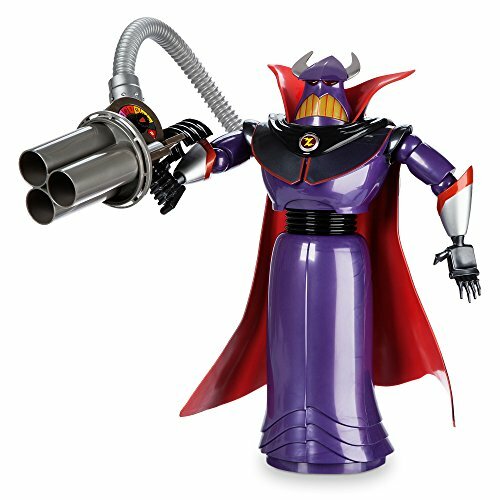 This Toy Story toy allows your kid to step into the shoes of Zurg, the Evil Emperor, as he gains control over Zurg’s Blaster, which comes in a retro package. 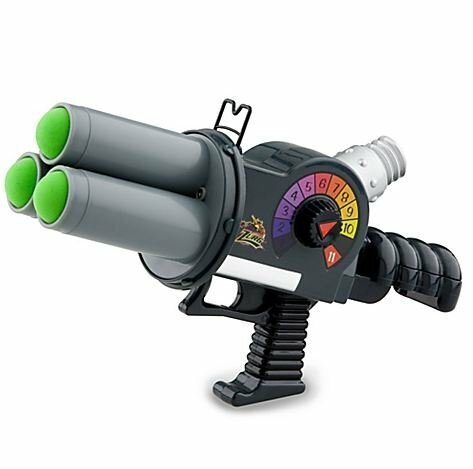 The blaster contains 12 foam balls that can be fired up to a distance of 20 feet. Having a look exactly like that of emperor Zurg’s blaster is a fun feature which fans of the Toy Story films have been appreciating. We were impressed with how it can also create a flash of light and sound effects when the trigger is pulled. While most other toys on this list are meant for toddlers and kids of the age 3 or above, this one is for the young kids above 6 years of age. It’s an advanced weapon meant to be held by experienced Galactic lords who can take out Buzz Lightyear and rule the entire galaxy! The look, sound effects and lights give this toy the feel of the real weapon of emperor Zurg from the movies. This makes it an extremely entertaining and fun item to play with for kids. This fun Toy Story pillow pal is the perfect gift for your Buzz Lightyear obsessed children. Soft and beautifully embroidered, this pillow size is just right for your kid to cuddle to sleep. The pillow is crafted to perfection with all the details of Buzz Lightyear as seen in the movie including ‘Andy’ written on the foot. Its bigger than a kid’s pillow and can be used as a recline support if needed. 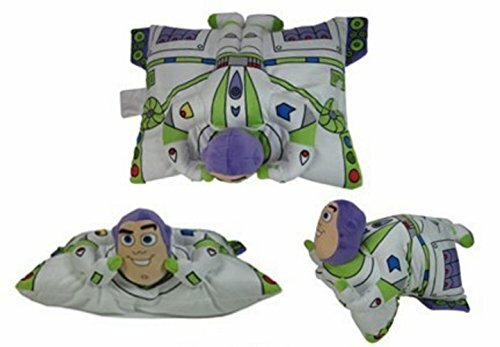 The Buzz Lightyear pillow pal is an absolute beauty and is sure to be a hit with your kids. The plush quality of the product and the beautiful fabric work makes it a perfect holiday gift for your little one. 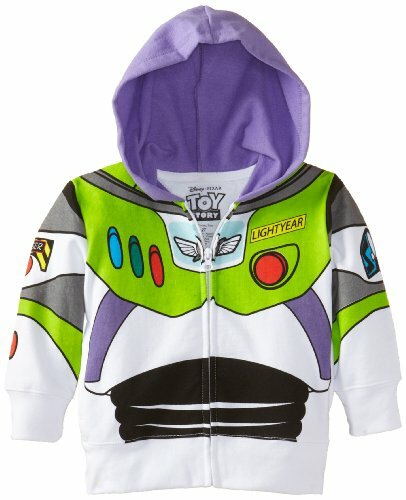 Bring out the Buzz Lightyear in your kids by getting them this awesome hoodie. Designed to mimic the suit Buzz Lightyear wears in the films, these hoodies are more than just collectibles. Kids will feel like Buzz Lightyear when they wear it, which can lead to some entertaining pretend play scenarios. The materials used in the product are soft to ensure it remains comfortable for your child. This hoodie has a great Buzz Lightyear design which makes kids feel like the character and pretend to be him. As a result, their creative thinking skills are stimulated. Toy story is a landmark film-franchise that is widely recognized as a modern children’s classic. With the first movie being released in 1995, it revolutionized the way such movies were presented by introducing breakthrough animation, fascinating storytelling and compelling characters. Multiple sequels have come out since with each building upon the last movie to give the audiences an experience that elevated Toy Story from a children’s film to a masterpiece to be enjoyed by all. 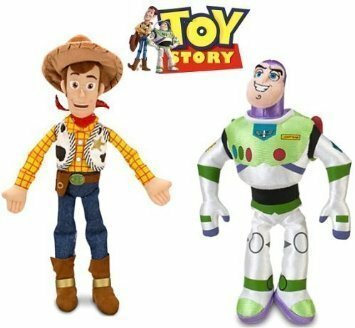 We here at doodleBuckets are celebrating the brilliance of Toy Story and have put together a list of toys you can get for your son or daughter as an awesome gift or just because you want to. We included a variety of toys to make up our list for your enjoyment. Our researchers dig deep to find the best toys you can get for your loved ones. From action figures to plush dolls, we’ve got it all! The Toy Story action figures are the hottest toys on the market. They are equipped with all accessories, speak iconic phrases from the movie and make for amazing gifts. Powered by batteries, these are a product of excellent engineering and fine craftsmanship that your kids will have an amazing time playing with. Toy Story plush dolls are all the rage these days. They look cute, are super soft and comfy and are great both as gifts and as collectibles. All of the plush dolls included in this list have gone through extensive quality checks to be child friendly. If your kid wants to own ‘em all, we have included playset collections that you might like. They has lots of character from the movie and make for an awesome gift to your little one. Gift these types and watch in amazement as your little one spends hours role playing with these toys to play out his their favorite movie scenes. We’ve also included our suggestions for twin collection – two characters in one box! They complement each other and will be the perfect playmates for your child as he navigates through the story with his two new favorite dolls. Fandom doesn’t die in owning toys. We at doodleBuckets understand that and have also included in our suggestion accessories to make your kid look as cool as their favorite Toy Story characters. From Buzz Lightyear hoodies to themed bed-sheets, from puzzles to piggy banks, we have it all! Get your child one of these and see them erupt with joy! The movie Toy Story is widely regarded as a modern day children’s classic and has a loyal fan base of children and adults alike. This movie has set a benchmark for animation films worldwide. Let’s take a look at some of the main characters according to the films that they appear in. This will help you pick out the toys that feature in your little one’s favorite installment of the franchise. Some of the main characters introduced in the first Toy Story movie are Woody, Buzz Lightyear, Jessie, Hamm, Rex, Slinky Dog, Mr and Mrs Potato Head, Bullseye, Barbie, and many more. We have reviewed many of those characters here as those are among some of the most popular ones available. Emperor Zurg is one of the main characters who is introduced in Toy Story 2 as the villain against Buzz Lightyear. Stinky Pete is the main villain of the overarching story of the film, however, there aren’t as many toys of that character available. The 3rd installment of the toy Story franchise includes a new and beloved character by the name of Lots-O’-Huggin’ Bear. This is the character who has a stomach that smells of strawberries! 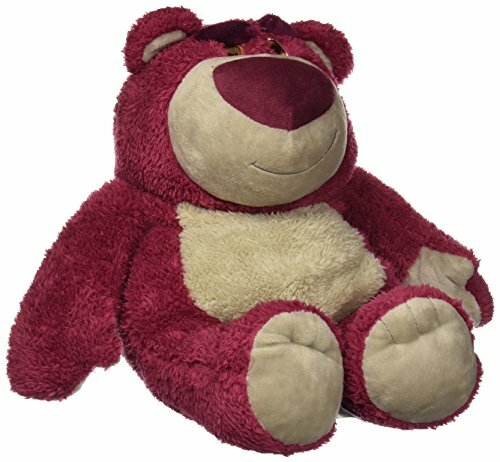 We’ve reviewed a Lots-O’Huggin’ Bear toy in this review which also has a belly with a strawberry scent. Chatter Telephone is another new character who ends up helping the characters out of a tricky situation. Therefore, we thought it would be a good idea to include it in our review as many kids love to reenact the scene and play with the phone toy. We understand that these toys will remain in proximity of children for a long time and therefore take safety and quality very seriously. All toys listed here qualify the highest standards of quality inspection and meet all safety checks set by the US, EU and other governments. The plastics used are recyclable and synthesized in a special process that removes toxicity and is safe even if the child puts his mouth to it. Other toys including plush toys are manufactured from products that do not harm children in any way and don’t possess a threat if child is left alone with the toy. Some toys do come with small parts which have been cautioned against in the list and adult supervision is recommended while playing with those toys. Toys are great fun and make great gifts for kids. The awesome thing about these toys is that they can double as educational tools if used in the proper way. Research shows that children who grow up role playing with toys go on to become more creative and easy going than those who don’t. Role playing with these toys is a great way not only to play but also to hone one’s creative thinking, storytelling abilities, and visualization. There is a direct correlation between the ability to vividly visualize and high IQ so it can be hypothesized that role playing might help your child improve his IQ as well. Not only role playing, plush dolls are great support friends. Children don’t usually have anyone to keep them company at all times and therefore often find a connection with toys akin to a real human relationship. The pitch black of the night can be very intimidating for a child but most find solace in their plush toys which they cuddle to sleep believing they have a friend beside them. We here at doodleBuckets have done the hard work and found you the best Toy Story toys that you can get for your children. Choose from a variety of selections and take Toy Story toy home that your child (or children) will love. All toys included pass quality checks and maintain standards required by the USA, EU and other major World governments. All all Toy Story toys are going to re-invoke those feelings of excitement that children get when they watched the films for the first time. Just pick an option from the review above and bring home the best Disney toy story toys! DoodleBuckets.com is a participant in the Amazon Services LLC Associates Program, an affiliate advertising program designed to provide a means for sites to earn advertising fees by advertising and linking to Amazon.com.